With our plan to watch zombie movies all month, we knew we would hit some bad ones eventually. And today we hit our first official bad one. It is a romantic comedy with zombies who are on a road trip to reunite one of them with their true love. Out of all of the movies we have watched so far, this is the first one that I would recommend that you skip. The movie starts out with one of the main characters waking up in a body bag, even though it is later shown that he should have woken up after receiving a zombie shot. That was just one of the first big problems that the movie had. I mean, I am all for wacky zombie movies, but this one was all over the place. The basic story line is that the main character's girlfriend's dad, killed him three years ago. Then he decided to use the body in a military experiment which was designed to wipe out towns. For some reason, the main character got a different shot than all of the others minus one stoner who killed himself. This leads the two to team up and they also take a regular zombie with them as a pet. All that is pretty bad, but it gets worse. Soon you have to listen to them and the military guys speak. 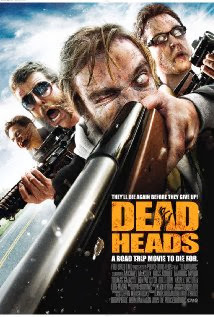 They had some of the worst dialog and acting that I have seen in any of the zombie movies we have watched so far. One of the bad guys was a horrible rip off from the guys in Super Troopers. Listening to that guy talked killed my brain cells. So maybe the directors real goal was to turn the viewers into zombies themselves. Zombie review? Not sure if it is even worth it, but here goes nothing. The main character zombies were able to walk, talk, and pee (yep they showed it) normally. And at the end of the movie, it was shown that they could even kiss humans with no negative effects. They did not need to eat or breath. They did however need to sleep for some reason. Not sure what that was all about except to help the plot move forward. Well they all can't be winners now can they? Even will all of the bad acting I would still give it a 2/5 in terms of zombie movies. I mean, its not like you have a lot of high expectation for the acting normally right? Keep checking back as we watch more movies for #undeadOctober!